People who use Biocence keep telling us how great it is. From one user to another, here are some of the things we have heard and seen about Biocence®. Recognized by Amazon as exceptional in the highest level of performance achieved by less then 2% of all sellers reaching the bar level set by Amazon the world's biggest retailer! I have now been using Biocence for my patients for over a year. I have several cases where the application of this compound has resulted in improvement and resolution of skin infections caused by MRSA (i.e. Methicillin Resistant Staph Auereus). In addition, I have also used it with success with patients who have an indwelling gastric tube for infections that occur around the opening. I recommend it highly as a safe and effective treatment for these conditions and will continue to use it on our patients as well. I work in Infection Prevention at Mission Hospital, Mission Viejo. I recommended Biocence seeing dramatic improvement in an MRSA skin infection that, despite a year of topical and oral antibiotics had not been completely healed. Having studied MRSA over 40 years, I believe the product may be admitted as medical intervention against hospital infections as a very strong antimicrobial agent. .The report published studies in The Journal of Burn & Wounds 12/6/04 titled “Combating Anthrax” “The Anti-Infective Armamentarium” has clearly shown that the efforts of your team in putting the formula together in the “Bio-Germ Protection” products details the success in eradicating the anthrax bug, as well as we believe will be successful against Smallpox, the Plague, and other pathogens possibly used by terrorist. We have found it to be extremely effective against a majority of Enterobactericae, otherwise known as the gram-negative organisms isolated from the gastrointestinal tract, which include non-enterics such as Pseudsmnas aeruginosa. This product is also effective against the staphylococci and streptococci to include VRE. The product also promotes wound healing as an effective antibacterial. John P. Heggers, PHD, FAAM,BCLD(AAB). I am a registered nurse and have used Biocence for years, primarily for wound care, as an antiseptic and antibacterial with great results. About a year ago my husband suffered a severe laceration to his hand and finger using an electric hedge cutter. 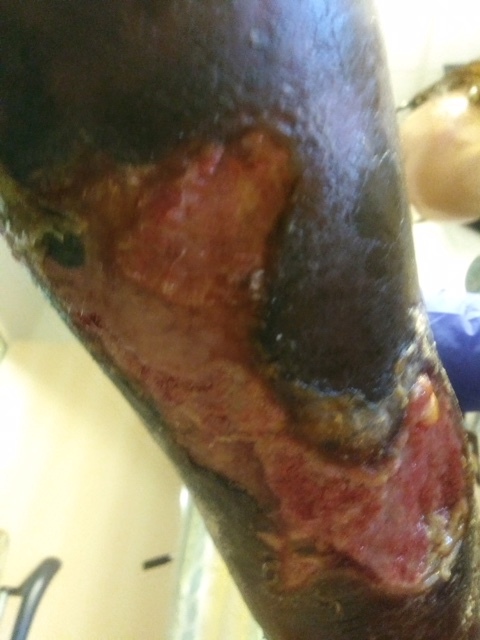 The wound required numerous sutures and emergency room physician was concerned about infection. The doctor recommended oral antibiotics but my husband declined. He did use Biocence several times a day and the wound healed beautifully without infection. Most importantly, Biocence kills harmful bacteria without damaging regenerative tissue. Great product! I wanted to share the amazing results that Biocence is having on my 11 year old daughter's acne. Unfortunately, for both of my daughters, my husband and I struggled immensely with acne in our younger years, so it was almost inevitable that it would show up in our children. Sure enough my eldest daughter started breaking out at 10 years old. Diet changes and numerous expensive over the counter medications did nothing or seemed to make her hormonal acne worse. We were hesitant to send her to a dermatologist, as we know she would most likely be given a prescription for long-term antibiotics, which we wanted to avoid completely if at all possible. During our months of acne research and product testing, I saw her self-esteem plummeting and it was taking a tole on me as well. About a week ago, for her birthday, we met family at the beach to celebrate and the topic of our struggles with her acne resulted in my Dad's wife providing us with a bottle of Biocence to try. I was basically desperate for anything to try at this point, as her acne was becoming more cystic by the day. It has only been a little over a week that I have been applying Biocence to her face and the results are outstanding. Over a short period of time, the large cystic acne has flattened to almost nothing and the redness is disappearing. I used no filters or touchups in my before and after photos and as you can see, there is a night and day difference in the inflammation and overall redness of her face. Prior to Biocence, the texture of her forehead was severely bumpy, red, and irritated with a mixture of large cystic pimples along with smaller pustules. Currently, all of the cystic pimples and pustules are appearing almost flesh tone and shrinking and becoming more flat each day. I am over the moon with hope and excitement for my daughter, as we continue to fight the acne battle with Biocence. With such great results early in our usage of this product, I can only imagine the results we will enjoy over the long-term. Thank you so much to Biocence for giving us an alternative to oral long-term antibiotics for our young girl! 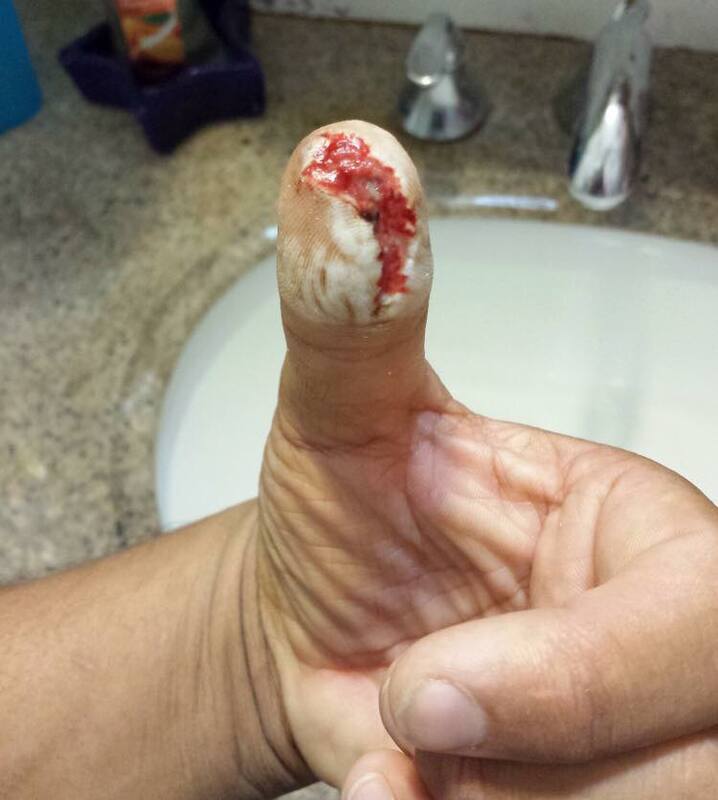 "Biocence was used on one of my construction workers who received a severe injury from a table saw. Almost cut his finger off. I ran home to retrieve Biocence to apply for him. I instructed him to use it four times a day and change the dressing each time. The wound healed completely in two weeks with no stitches. Right now looking at his thumb you cannot see a scar." "I believe Biocence Saved My Son"
"I am writing to express my appreciation at your product, Biocence. Last year during The 2007/2008 Palmdale High School wrestling season, my son contracted a staff infection. At first we did not now what it was. Then we learned through a small scrape on his knee he contracted the infection from a wrestling mat at a competition at another local high school. My son was very aware of MRSA and was fanatical about washing after every practice with extremely hot water and anti bacterial soap. We also washed all his clothes in hot water. This did not protect him. The infection spread quickly, and caused red lines up his legs. We took him to the doctor who said daily antibiotic treatments would help. At this same time we learned of your product through a friend. She quickly brought lotion and spray over to us. My son cleared up quickly after that, (A matter of days). I realize MRSA IS A SUPER BUG AND ANTIBIOTICS DO NOT HELP. I believe Biocence saved my son. Since then, we have tried to convince competitions that mats must be cleaned after each match. This seems to be an inconceivable idea. I believe just spraying the areas would help. My son continues to wrestle as it is his passion. He RELIGIOUSLY uses the spray and lotion daily. We are confident in this product. I use it as we leave hospitals and all sports competitions. I believe the wide use of Biocence would STOP the spread of these deadly infections. It’s time to protect our kids." "OMG this spray works miracles!! Kicked my staph infection, sprayed it in my ears, nose, and throat to kick a head cold, helped with a friend's boil, helps with type 1 diabetic infections. Will never again be without a bottle!!" One Biocence user gave us some before and after pictures of their MRSA infection. The visible difference is Biocence in less than 48 hours. My husband and I were introduced to Biocence years ago. Even with all the years of experience I continue to be amazed! My nephew came to me with what he thought were bug bites. I recommended Biocence, however being young he ignored the advice and went about his business. Within a week his whole body was covered with oozing itchy sores or various sizes. It was obvious these were not bug bites but we had no idea what it was or how it spread so rapidly. We sprayed Biocence over his whole body. After just this one application the sores dried up and began healing. Biocence has become a go to staple in our home and this is just one example of why. Biocence In Use Assisting Doctors Healing Botanically And Naturally A War Vet Patient. After Months Of Suffering from Hospital Inquired Infections. Nothing was working! In Just Weeks! All New Growth Of New Skin And Closing Of The Wound. Micro Quality Laboratories found the initial results of their studies of Biocence's effectiveness "so incredible" that they increased the level of the bacteria inoculated to see if Biocence could still destroy the sample. To their amazement, the results were repeatable. My name is Gary Fusco and I am a Christian counselor and missionary to India where I work with the poorest of the poor for two months every year. I work with the pastors of several churches in Hyderabad, a large city of 8 million people. In their small churches I preach the gospel, counsel individuals and families, and pray inner healing prayers with hundreds of people. From our base parish we travel to remote villages doing the same healing work and sharing of the gospel with these destitute people. On my last trip I was given six bottles of Biocence, which I sparingly shared with as many of the sick as I could until I sadly ran out. The results were more than remarkable for these poor people who would never be able to receive any medical care, and would have to live with their sickness. Skin rashes and infections were clearing up in a day. Many people with dysentery, viruses, and gut disorders, which normally take weeks to recover from, were being healed in hours! I gave a full bottle of Biocence to a girl with HIV who was very sick. She took six drops twice a day until she ran out. In three weeks time she reported a substantial lessening of the symptoms and of her suffering! She and many more like her I firmly believe can be completely healed! It is with great hope that you consider a donation of Biocence toward my missionary work in India. I will treasure it as the life-changing gift that it surely is. I am confident that I can bring healing and relief to the sick and suffering in all the villages that I am called to share the love of Jesus with. Thank you for your contribution of the topical spray Biocence to legacy Cottage. We are a 24 hour HIV hospice home health care facility located in Dallas, TX. We currently house 7 residents and are grateful for the many uses Biocence provides both staff and individuals living at Legacy Cottage. For our staff it provides a quick and effective way to combat germs and for our residents living with HIV it provides many uses fighting against skin infections common amongst HIV patients. We have seen instant relief and skin seems to repair quickly after applying Biocence to infected areas. We will continue to use Biocence and have been amazed at its many uses for both germs and HIV related skin irritations for our HIV patients. Again thank you so much. Thank you for the generous donation of antiseptic spray and lotion this past May. When the call went out to encourage hand washing during the swine flu out break, you came through. We made it available to teachers and students and feel Biocence made a difference. In a public school setting, germs can pass quickly from person to person and proper hygiene is our paramount concern. Even though your product is less well-known than national brands, we feel that it is a safe product because your sanitizing agent contains no alcohol. Alcohol in any form on a school campus has potentially dangerous consequences. Alcohol consumed or applied topically can damage healthy tissue. The Desert Willow community appreciates your efforts at keeping us safe. Thank you again for stepping up and answering the call. We have been greatly blessed by your generosity of giving us Biocence. We have found the greatest success in the gastro-intestinal illnesses. We have not seen positive results for HIV/AIDS but I still think this can be achieved. I would be thrilled to continue using and testing Biocence. I am sure we will see many more positive results. The results I am seeing for vomiting and diarrhea are amazing and this is probably the greatest health issue we have here. I would love to do more with HIV/AIDS testing. Please let me know your thoughts. Thank you again. We are so grateful. You are truly saving lives here. More letters (All names link to PDFs). Emma had a routine surgery to harvest stem cells. A 8 inch incision was made directly behind her left shoulder and adipose tissue was taken from her "armpit" area. The incision was then closed with intradermal stitches and staples. A drain tube was inserted parallel to the incision and was stapled into place. 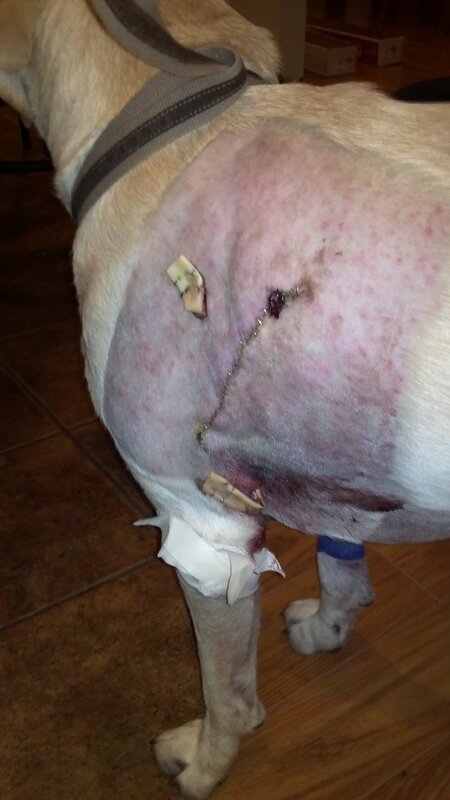 Biocence was used 3 times a day directly on the incision site, diluted into her drinking water and sprayed on her food. Her drain tube was removed prematurely one week after the procedure. Biocence was used on the instruments used to remove it. The open channel where the tube had been, both internally and externally, was sprayed with Biocence. The incision site filled with fluid and swelled to the point it needed drained by hypodermic needle, which was sprayed with Biocence before using. When the incision filled again, a drain tube was reinserted opposite of where it had been previously inserted. Again, Biocence was used to on both the instruments used and the area being worked on. Emma was prescribed a antibiotic for the first 3 days, after that, Biocence was the only treatment applied. The vet had scheduled Emma to remove the staples in 21 days. After 14 days, the incision had healed to the point where the staples could be removed a full week earlier. The was never at any time any sign of infection and the incision healed so completely that there is no sign of it all. Her medical staff marveled at the speedy recovery and lack of complications normally associated with this procedure. Dino had surgery on his left rear foot. The first joint of a toe was amputated and a large gash that stretched from the bottom of his pad to above the toe nail was stitched together. He was put on a weeks worth of anti-biotics, pain medication and sedatives. Unfortunately, Dino gained access to his injured foot and chewed the stitches out on the third day. Treatment with Biocence began on day 8 when his protective boot and bandage needed to be changed daily. It was applied every day, three times per day for the next 2 weeks. No other treatments where used. He returned to the vet two times per week for check ups and again, Dinos medical team was astounded at how quickly the wound healed and how completely it healed. The injury location made it a high probability of infection, there was absolutely none at all. While it took longer than we expected to heal due to him chewing the stitches out, once the application of Biocence was started, the healing process was accelerated and his foot healed completely, minus his toe nail. I was desperate when my young (but huge) male cat came home with scratches on his face, and cuts to his leg, and flopped on his bed, bloody and sore. I put Biocence drops in a spoon and applied it to the affected areas with my finger for a couple days (2X a day). He was running around the second day and everything healed within a week...never infected!! E-mail Us at our Contact Page. Copyright 2019 BGP LLC. All Rights Reserved.